Do you earn enough to survive in Singapore? First, I looked at someone who earns a low income of $800 monthly (Chart 1). You can see that if a person spends on the most basic things, and if he/she earns only $800, he/she would not be able to save at all. But there’s more. 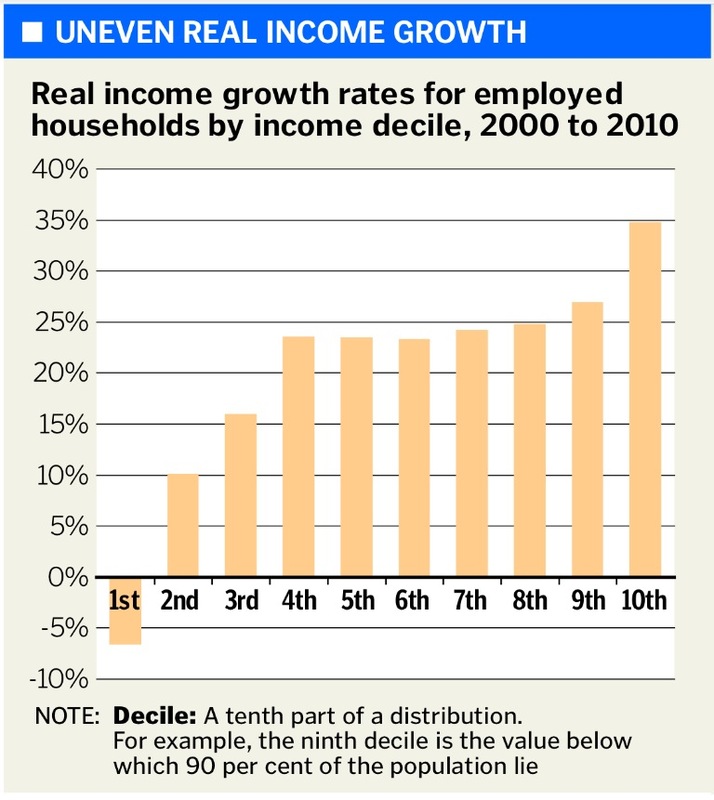 The real incomes of low-income earners are likely to keep falling, as they had over the past decade (Chart 2). Also, over a person’s lifetime, if he/she is a low-income earner, his/her income will also fall as he/she ages (Chart 3). So, for a low-income earner, he/she won’t have enough to save, will most probably fall into debt, won’t have enough to pay for the debt, won’t be able to retire and will be scared for his/her life if he/she falls sick. 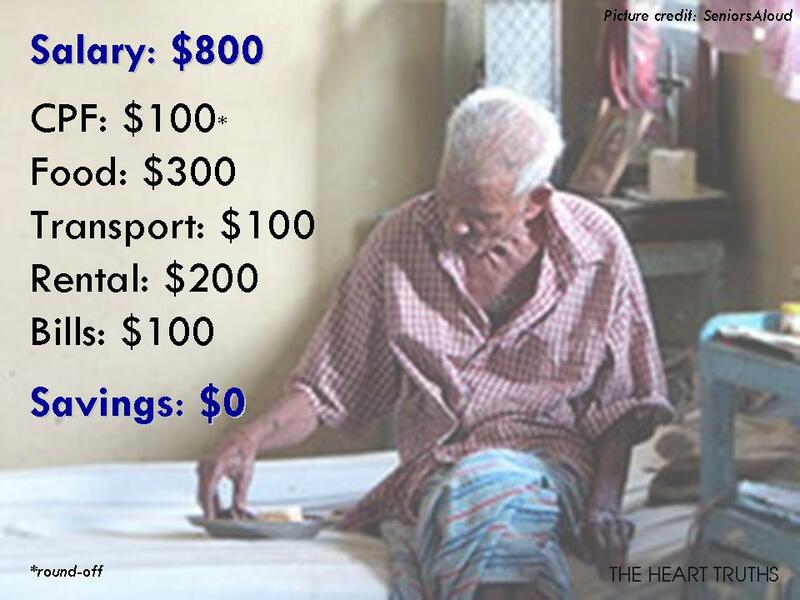 If he/she gets hospitalised or needs an operation, he/she will have no money at all to pay for the bills. 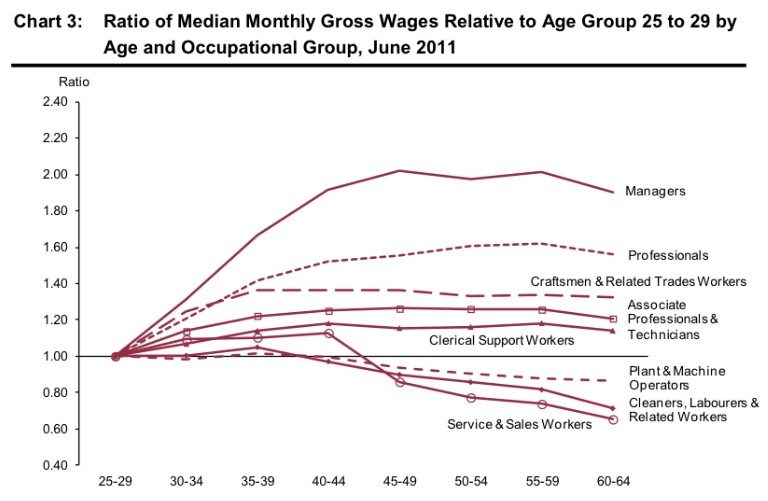 So, for a low-income earner, they will never be able to save and retire (Chart 4). What if we look at another scenario, of a family with 2 children? 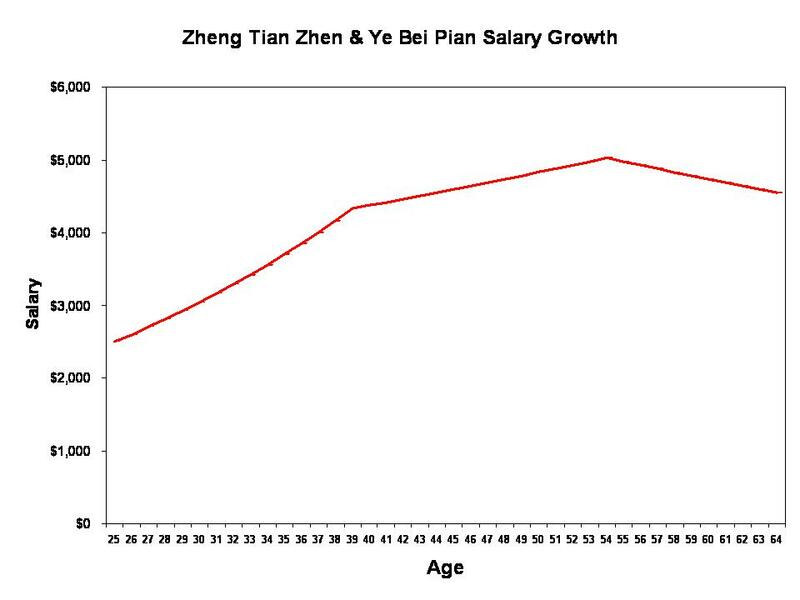 In Chart 5, we see Zheng Tian Zhen, who starts work at 25 and earns a starting salary of $2,500. Her boyfriend, Ye Bei Pian, also earns a starting salary of $2,500 at 25. 20% of their salary is deducted for the employee CPF contribution monthly. All expenses (food, transport, bills, miscellaneous things) increase by 2% annually, to account for inflation. They spend 20% of their monthly salary on insurance. 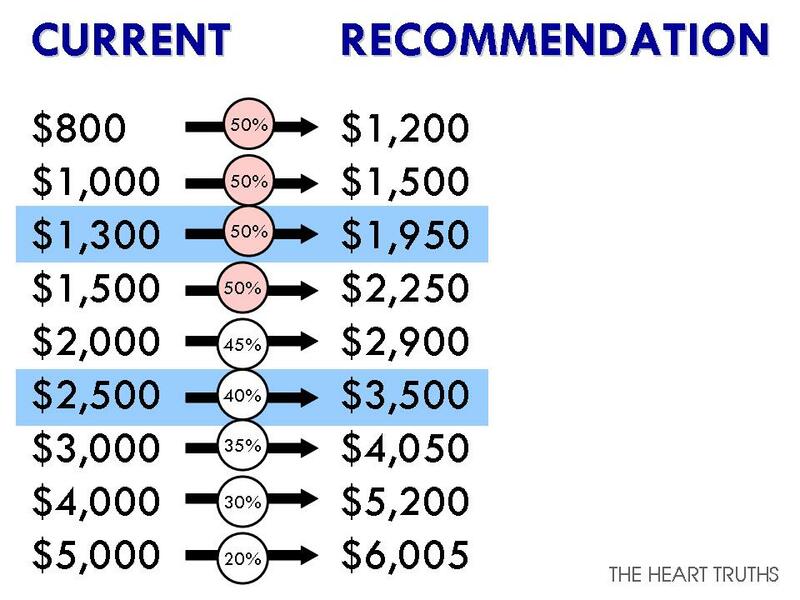 Based on what they each spend in Chart 5, assuming that they are very thrifty, they should be able to save $500 monthly in the first few years. Say 5 years later at age 30, they get married and buy a flat for about $300,000. After another 5 years, at age 35, they give birth to a set of twins. Assuming that they use their CPF to pay for the down payment of the flat, and a proportion of their housing loan, they will pay $500 every month, from their salaries, on the housing loan. Their expenses on food will double for each of them (for each children), and they will start spending 25% of each of their salaries on insurance, to buy insurance for their children. Their expenses on transport will also double in a few years’ time. Chart 7 will be what their expenditure will look like in 2023, at the age of 35, 10 years from now (note that the figures are after accounting for inflation). From now onwards, they wouldn’t be able to save for the next 25 years, until their children reach adulthood, graduate and start working. Hopefully, the insurance that they buy will be able to cover for their children’s education. Chart 8 shows what their expenses will look like in 2048, at age 60, when their children finally graduate (note that the figures are after accounting for inflation). They will be able to start saving again for the next 5 years before they retire at 65, but most of the new savings will go towards paying the accumulated loans over the past few years. They would also move to start paying 35% of their salaries into insurance, to purchase the more expensive hospitalisation plans – which Medishield wouldn’t fully cover. So, at the end of it all, Zheng Tian Zhen and Ye Bei Pian would not be left with any savings. They would have spent most of their CPF paying for the housing loan that they would have so little left that they wouldn’t be able to meet the CPF Minimum Sum, and wouldn’t be able to take their money out. Looking at Chart 9, assuming that a person would need to spend $1,000 to $1,500 every month in 2013, by 2053, this would be around $2,200 to $2,300 every month, which means annual expenses would be between $27,600 to $39,600. If a person lives until the life expectancy of 81 years old, he/she would need enough savings for another 16 years, which means that when he/she retires, he/she would need to have saved $450,000 to $640,000. So, assuming that Zheng Tian Zhen and Ye Bei Pian have no savings but each receives a payout of $100,000 from their insurance, this might only last them for only a few years before they have to start working again. Or they might have to delay their retirement until past the age of 70 or 75. So, you can see that for low to middle-income earners in Singapore, it would be very hard for them to survive in Singapore with their low pay. In 2013, Singaporeans need to set aside $148,000 in their CPF before they would be able to take their CPF out. According to the CPF Board, “cash balances can only be withdrawn after setting aside both the CPF Minimum Sum and Medisave Required Amount. Not only that, there is also the Medisave Minimum Sum of $38,500 that a Singaporean needs to also set aside. In total, together with the CPF Minimum Sum, a person would need to set aside $186,500. Working backwards, does this mean that if you don’t earn $884, you won’t be able to meet the minimum sums at all? However, currently, 16% of Singaporeans earn less than $1,000 – which means that around 15% of Singaporeans will never be able to meet the CPF Minimum Sum and will never be able to take their CPF and Medisave out. Also, considering that the incomes of the low-income earners drop over time, would more than a quarter then not be able to meet their CPF Minimum Sum? Will this figure be 20% or 25%? 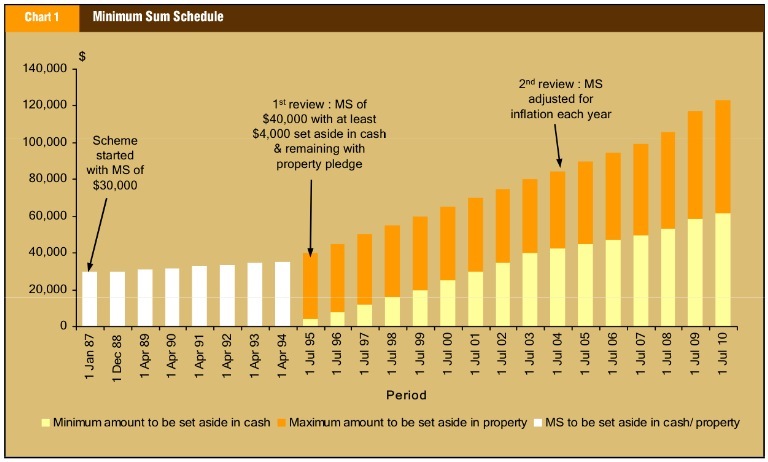 It is stated by the CPF Board that, “the Minimum Sum was set at $80,000 in 2003 and will be raised gradually until it reaches $120,000 (in 2003 dollars) in 2015 (Chart 14). These amounts will be adjusted yearly for inflation. ” What happens after 2015? What if the government decides to keep raising the Minimum Sum again? Then would we need to earn minimally $1,500 or $2,000 now to be able to meet the Minimum Sum when we retire in 40 years’ time? Why did the government make the CPF and Medisave minimum sums so high that at least 15% would not even be able to meet these minimum sums in the first place, no matter how hard they work? Why does the government insist that Singaporeans need to have a minimum sum in their CPF if the money gets locked in and trapped inside, and at least 15% of the people would never be able to get their own money back? Why does the government not implement a minimum wage, knowing that the low-income earners won’t be able to meet the minimum sums without a minimum wage paid to them? Why does the government continues to call the CPF a retirement fund or a golden nest, when at least 15% of Singaporeans can forget about the money that they set aside in the CPF? Why doesn’t the government implement a more progressive contribution structure on the CPF where the rich pay more and the poor pay lesser, so that the poor would be protected by the so-called “national insurance scheme”? How does the government expect the large proportion of Singaporeans to be able to retire if they wouldn’t have any savings or retirement funds? If so, what is the government’s responsibility to the people? So, all in, how much would Singaporeans need to earn so that they would have enough to save and retire (if they were to spend on the most basic things). 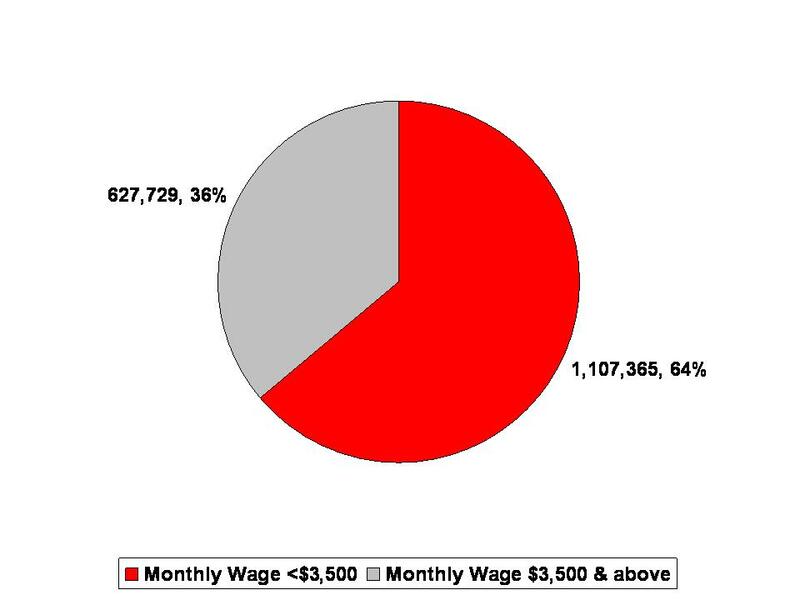 Based on my rough calculations, for a person who is single, he/she would need to earn at least $2,000 every month in order to be able to do so (Chart 15). And this is if he/she lives a very basic lifestyle, with no holidays, no further education and no upgrading. 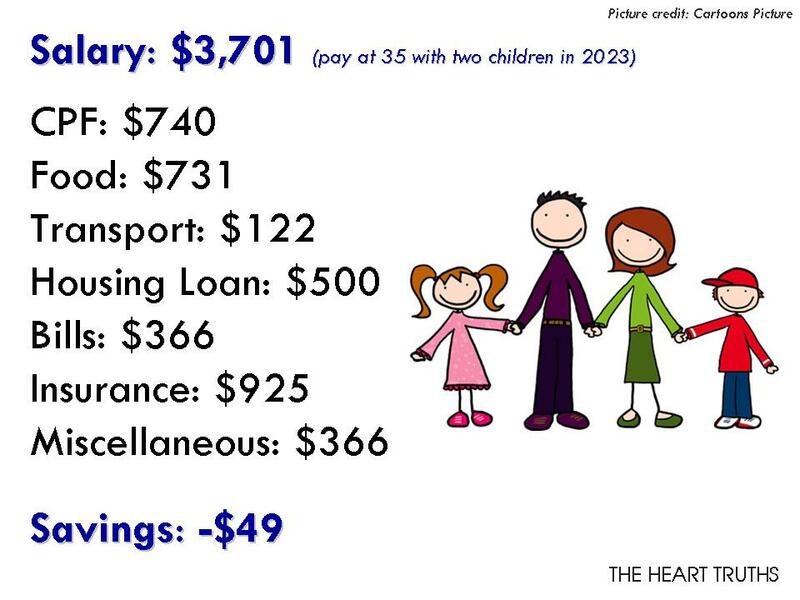 For a family of 4, each parent would need to earn at least $3,500 every month, and that is if both of them are very thrifty, and again, on a very basic lifestyle (Chart 16). But how many Singaporeans currently would be able to earn these amounts? As can be seen in Chart 12, nearly 40% of Singaporeans are not even earning $2,000. And if they have children, the $2,000 wouldn’t be enough at all. Also, as can be seen in Chart 17, around 65% of Singaporeans are earning less than $3,500, which means that only a third of Singaporeans earn more than $3,500 and can afford to have children somewhat comfortably. So, Is The Government Helping? Question is, does the government know that Singaporeans would need to have at least $2,000 to be able to even have a basic standard of living in Singapore? The answer lies in the Workfare Income Supplement. According to the CPF Board, “The Workfare Income Supplement (WIS) Scheme was announced during the 2007 Budget Speech as a permanent scheme … to supplement the wages and retirement savings of older low-wage workers as well as to encourage them to stay employed.” To qualify for the WIS, the worker must be a Singaporean who “earn(s) an average gross monthly income of not more than $1,900”. And note that the definition of “average gross monthly income” refers to the “basic salary and additional wages like overtime pay and bonuses”. So, indeed, the government has calculated and knows that someone earning less than $2,000 would face massive difficulties surviving in Singapore. But, how much is the government actually helping? To be fair to the government, let’s look at the worker earning $1,000, because this is the wage range where the WIS payout is the highest. If you are 60 and above and earns $1,000, the government will give you $3,500 for one year. But out of this $3,500, $2,100 will go into CPF. The worker will only receive $1,400 in cash. What does this mean on a monthly basis? This means that the worker will only receive $116.67 every month. So, in total, the worker will receive a grand total of $1116.67 in cash every month. What about a 35 year old who earns $1,000? 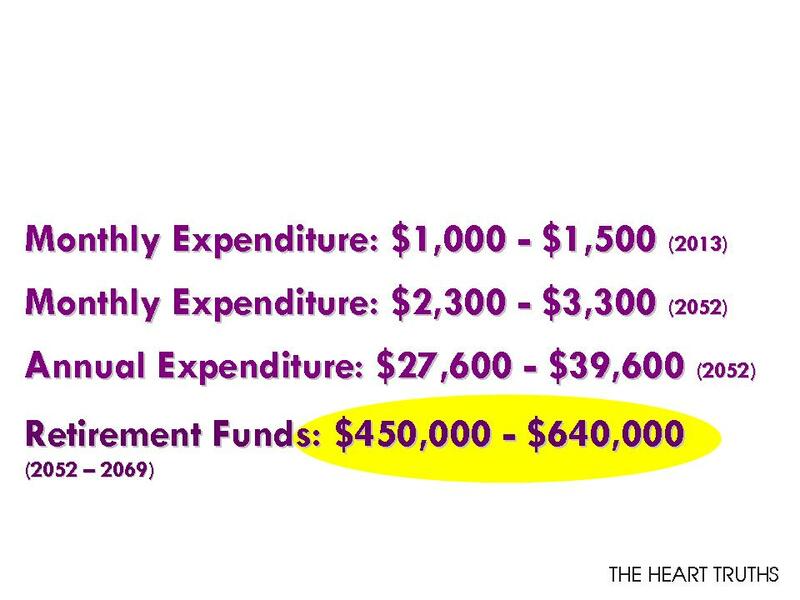 He/she will receive only an addition of $46.67 every month, which will amount to only $1046.67 every month. A worker below age 35 won’t receive anything under the WIS.
Is this even enough? 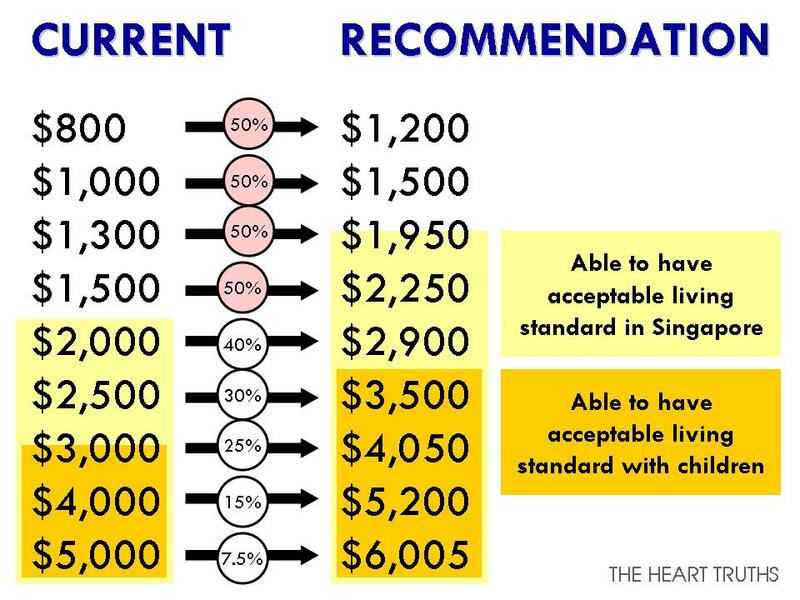 A Singaporean would need to earn at least $2,000 monthly to be able to have a most basic standard of living in Singapore. 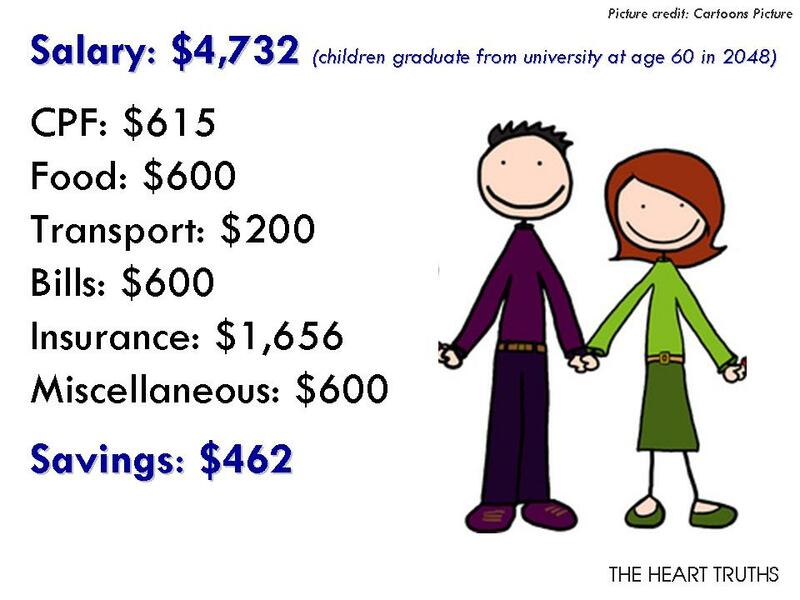 But even with the WIS, even with the highest financial assistance, a person would still earn only $1116.67 montly, and this is only when you are pass 60. But this is no where near $2,000! Do you remember Prof Lim Chong Yah’s Shock Therapy to our wages last year? I haven’t seen his actual proposal, but according to Yahoo! Singapore, he had “urged the raising of salaries of workers earning less than $1,500 by 50 per cent over three years while imposing a moratorium on the country’s highest wages during the same time”. And you know what, Prof Lim was right. His proposal is exactly what needs to be done in Singapore. In Chart 18, I tried to do a rough calculation of our wages if we had followed this proposal. 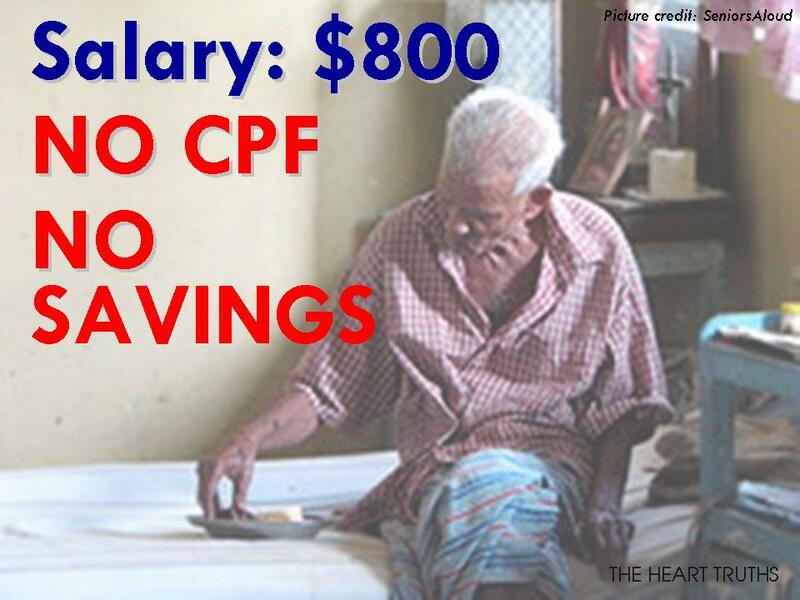 If we follow Prof Lim’s recommendations, there would be a lot more Singaporeans who would be able to save and retire. If you are earning $1,300 now, your wages would at least increase to nearly $2,000, which would at least allow you to be able to save and retire, if you live on a shoestring budget. 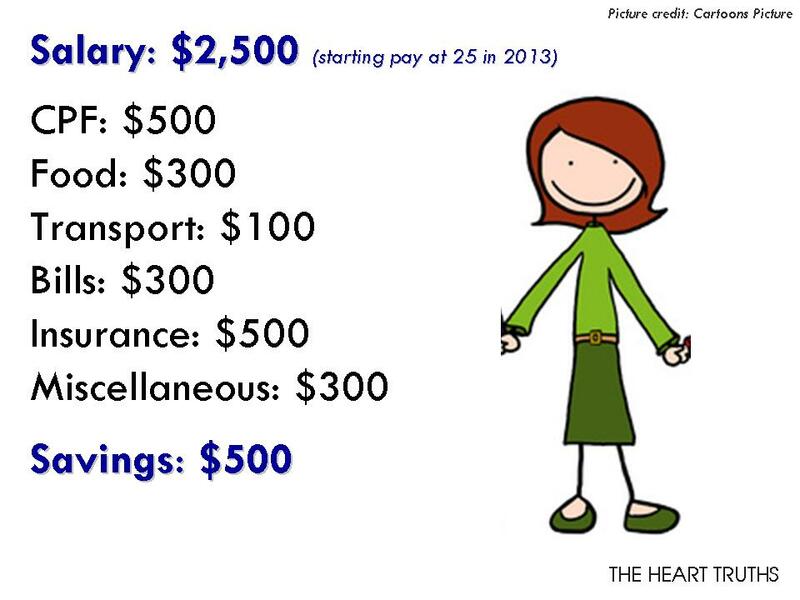 If you earn $2,500 now, with the uplifted wages, you would be able to earn $3,500 and it would be more affordable for you to have children. Also, as wages spike at the bottom, and the growth at the top remains small, as Prof Lim had recommended, this will have the effect of equalising the wages across the board and reducing the income inequality. Prices might rise a little but with more people having higher incomes, the effects would be more manageable. So, instead of nearly 40% of Singaporeans who earn less than $2,000, this would be reduced to a quarter. Instead of 65% of Singaporeans earning less than $3,500, this would be reduced to about half of Singaporeans. What this also means is that there will also be an increase in the number of Singaporeans who would be better able to afford to have children and who would be more likely to do so (Chart 19). This will have the effect of increasing Singapore’s fertility rate as well. So, now do you also know why Singapore’s fertility rate has been dropping? There’s really no point in bringing a child into this world if you cannot provide adequately for the child, let alone for yourself. But then, Prof Lim’s proposal was slammed by the government. Secretary-General of the National Trades Union Congress Lim Swee Say had said that the proposal was “risky”. From this article, you would see that far from it, Prof Lim’s proposal is necessary. If anything, Prof Lim had also been conservative in his proposal. To be able to protect all Singaporeans, wages for the poorest in Singapore would need to be increased by 100%, not just 50%! Clearly, the wages of Singaporeans and the workers in Singapore have been depressed for far too long. As Chart 2 had shown, the real incomes of low-income earners have actually dropped over the past decade. Also, for the majority of Singaporeans, they have seen very slow growth in their incomes. However, the incomes for the rich have shot up. There is clearly very uneven growth in incomes in Singapore, such that a growing number of Singaporeans are no longer able to live adequately in Singapore. A growing number of Singaporeans are not able to save and retire and that means that YOU will also very likely have to work until you are pass 70 or 75, or even until your death. Is this what you want? 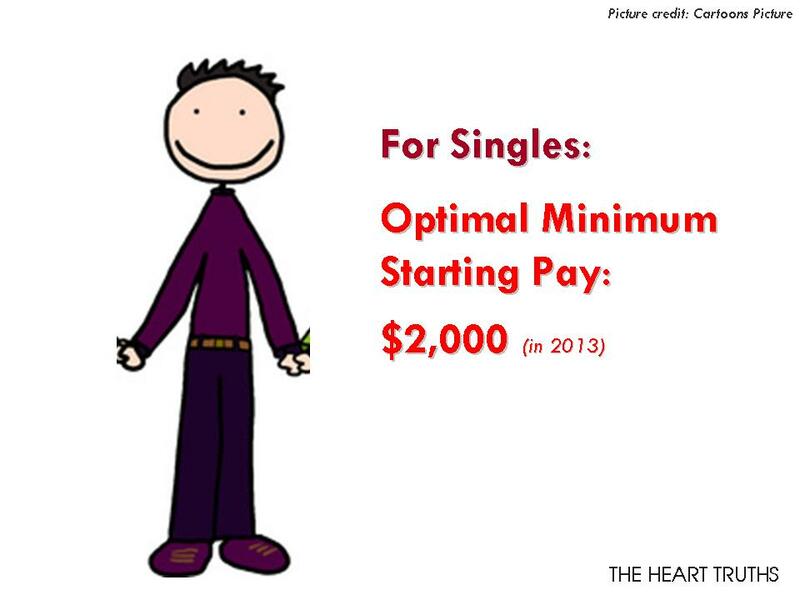 In Singapore, if you are single, you should minimally be able to earn $2,000. 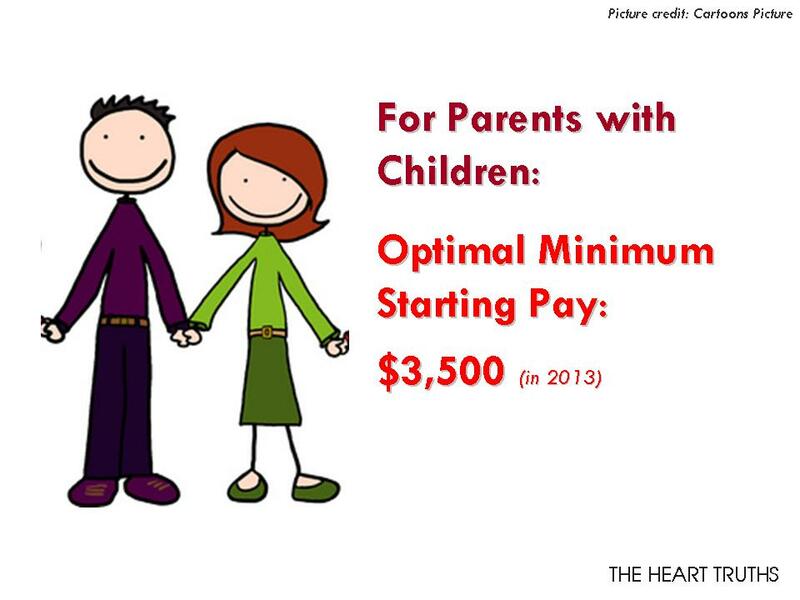 If you want to start a family, you and your partner should at least earn an average of at least $3,500 each. If not, life will be tough. Yet, the government and businesses lament that Singaporeans do not want to take up service jobs that pay $1,300 when it’s obviously not enough to survive in Singapore. Yet, the government tells us that it is not necessary to get a degree. If we don’t get a degree, who’s going to pay us $3,500, or even $2,000, at the current state of our policies? So, before the government makes fanciful suggestions that degrees are not important, they should take a look at their policies and change it to ensure that even if a person doesn’t have a degree that they would be able to earn enough. If the government doesn’t believe people need to be paid higher wages, then they should to increase the interest paid to the CPF of the low-income earners so that they would be able to accumulate even that little amount of wealth. Clearly, what needs to be done in Singapore is to drastically increase incomes for the low-income earners in Singapore, increase public spending, especially on healthcare, and to also increase the CPF interest rates, at least for the poor and elderly, so that they would be able to live and retire respectably. But then, this is nothing new, is it? This is what we have been telling the government for many years now. But why hasn’t the government acted on it? And if so, why does the government continue to think that it is acceptable that we would need to work till our deaths or that life would be difficult for us? You had voted for this ruling party for the past few elections, despite the many reminders and warnings that had been given. You have another chance to set things right in 2015/2016. It’s all up to you now. It’s in your hands. Whether you will be able to live adequately and retire comfortably, it’s all up to you now. Following this article, do you know that not only are Singaporeans paid the lowest wages among the high-income countries, what Singaporeans actually have to fork out of our pocket to pay for taxes, CPF and for basic necessities (healthcare, education, transport etc) is actually almost the same as what the Nordic citizens pay? But do you know that because Singaporeans earn only half the wages that the Nordic citizens earn, this means that we deduct a much heftier proportion of our wages into paying for these things and have a much lower purchasing power after that. In fact, for the poor in the Nordic countries, they can still save enough to retire. However, in Singapore, not only the poor but a large part of Singaporeans will never be able to save enough to retire. You can read more in this 10-part series written by Leong Sze Hian and I on the tax that Singaporeans are paying here, and how we are actually getting the short end of the stick. We voted for this ourselves. Do you want a loan offer without any payment of the approval fee? If yes, please contact kiva_finance@outlook.com following details and go ahead. Are you looking for a loan that will change your life for the better If yes please kindly contact us kiva_finance@outlook.com Contact us with the following details and go ahead. Do you need a loan with a offer that will be the best in your life or have you falling into the wrong hands? If yes, please try one of the best companies in the world and get your loan on time, contact kiva_finance@outlook.com Contact us with the following details and proceed. Reblogged this on A Young Singaporean's view. Singaporeans, Are You Being Taken Care Of By Your Government? 60% Of You Think You Have A Good Job? Really?